Mars Finance will, together with blockchain pioneers from China, go to New York, the capital of global finance, and chat with each of NASDAQ, Ripple, Standard & Poor’s, Morgan Stanley, Barclays and Digital Galaxy, the global largest digital currency investment bank! The founder of Mars Finance, Fred Wang said that Mars Finance U.S. Version will be released right after the Summit. The global blockchain market is uncertain, but the power of transition has been brewing. 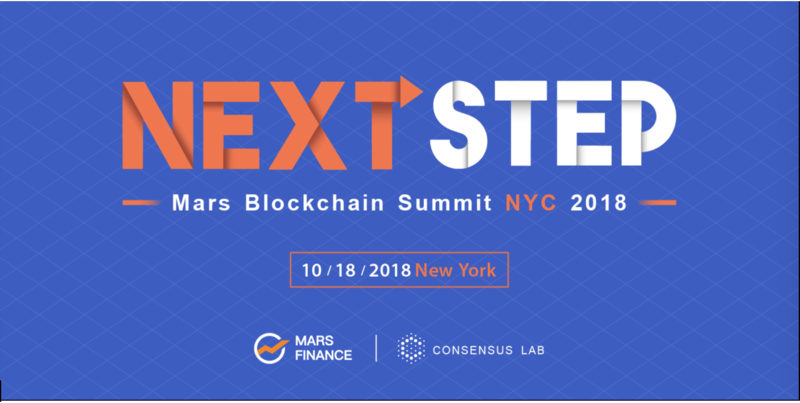 On October 18, 2018, Mars Finance, the leading deep service platform for blockchain, will hold 2018 Mars Blockchain Summit NYC in the Westin New York at Times Square. Gathering at the Summit, powerful financial institutions and industrial leaders from Wall Street and China will hold one-day summit dialogue around “NEXT STEP” to find a turning point for global blockchain industry in the context of downturn market. Mars Finance will also have a new move. Fred Wang, the founder of Mars Finance, discloses that Mars Finance U.S. Version will be officially released at the Summit. Using this Summit as an opportunity, Mars Finance will gradually upgrade to an international blockchain service platform from China’s leading blockchain service platform, thus further strengthening deep connectivity with global blockchain industry. At this Summit, Mars Finance will gather leaders from China’s blockchain industry to carry out in-depth discussion and exchange together with a lot of investment institutions, financial companies, and regulatory authorities from Wall Street with respect to a couple of topics that reverses the market and brings about new opportunities. A lot of hot topics including regulation and policy, stablecoins and secondary market, next generation of the public blockchain, blockchain economic model and governance, will be included. The Summit has attracted active participation of top investment banks from Wall Street such as Morgan Stanley and Barclays. Senior management of Digital Galaxy, the global largest digital currency investment bank, also confirms its attendance at the Summit. Honorable guests from global top powerful institutions such as NASDAQ and Standard & Poor’s will also express their expert opinions with respect to regulation, compliance, and other perspectives. Shuoji Zhou, a representative figure of China blockchain industry and founder of FBG Capital, a leading blockchain investment institution; Fred Wang, founder of Mars Finance and partner of Consensus Lab, an institution invested by Mars Finance; Chuanwei Zou, chief economist of Bitmain; Dao Yuan, chairman of Zhonguancun Blockchain Industry Alliance; Feng Han co-founder of Elastos; and Tianyuan Wei, partner of Sharp Eye Capital also confirm that they will be present in Manhattan for a collision of global finance ideas from Wall Street. The confirmed participants also include Jeffrey Wernick, early Investor of Airbnb, Uber and Bitcoin; David Namdar, Partner of Galaxy Digital; Katina Stefanova, CEO of Marto Capital; Danny Aranda, Managing Director of Ripple; Keith Azzopardi, Ambassador of Malta to the USA; Franklin Urteaga, Former Clinton White House Tech Advisor; Sarah Olsen, Head of Business Development of Gemini.com; Eugenio GomeZ, Restructuring and Finance Expert at Harvard Law School etc. Currently, popular stablecoins such as USDT, GUDS, PAX and USDC will hold the most attractive roundtable discussion. Following 2018 Silicon Valley Mars Blockchain Summit & 1st China-US Blockchain Leaders Dialogue on August 28, 2018, Mars Blockchain Summit NYC 2018 will launch large-scale summit events again in the U.S. This unrivaled event is hosted by Mars Finance and co-hosted by Consensus Lab, Liaoyuan, Crypto Capital, Sharp Eye Capital, EUB Chain, and DFG. In addition to theme summit, a lot of events including super roadshow and sleepless night link cocktail party will also be held. Beijing x New York, blockchain leaders from Beijing will make passionate collision with powerful financial companies and research institutions from Wall Street. 2018 New York Mars Blockchain Summit will become an important event in the global blockchain industry recently. If you are interested in the Summit and want to be a part of this, please visit the summit’s page for more information. Rex is Editor-in-Chief of TheTechyTrends and was previously Editor-in-Chief of GamerLive and China Watch Online. Rex has a real passion for gadgets, mobile, technology and business.